I am a sleep miser. Those who know me well are certain of that fact. There are few reasons that are worth waking me earlier than usual which do not cause impending wrath. I am attached to my sleep like an abalone to a rock. The only way to separate us is by being pried by the strength of a sea otter (or in my case, and more cute, is my 2 year old daughter). Thankfully my husband is an early, and dare I say, happy, riser. He makes the coffee, and lets the animals out to do their business in the morning. He gets our daughter up and started on breakfast. Meanwhile he lets me gradually wake with the sounds of a cheerful eating daughter, birds singing and the wagging tail of one of our dogs against the front door. These are happy mornings. Feeling quite spoiled I am trying some new recipes in the event I am blessed with the superhuman ability to wake up earlier than him. Then I can someday (maybe...Valentine's Day?) serve up some breakfast in bed and return the morning blessings that he gives me each day. 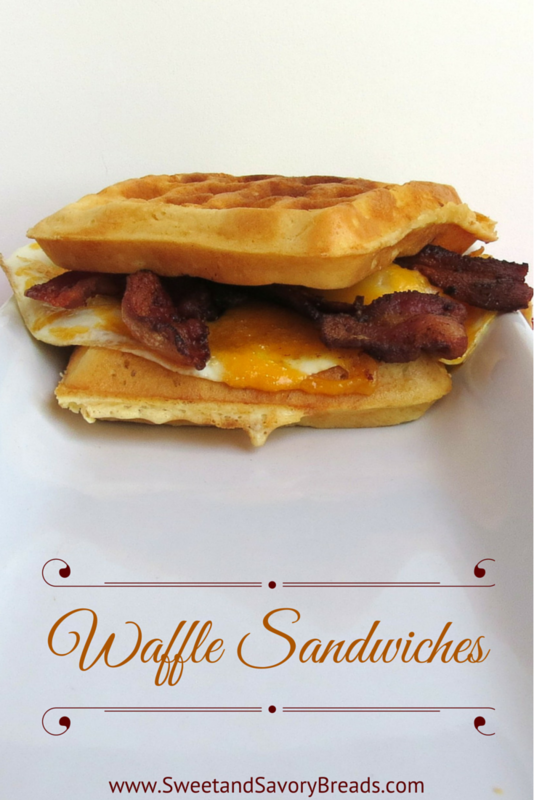 Today's recipe makes two waffle sandwiches. It is pretty quick since I use a biscuit mix to make the waffles. It is also hearty with eggs, cheese and bacon piled in between. You can also try adding roasted bell peppers, pepper jack cheese, or breakfast sausage in between. I suppose any number of sandwich combinations can be used...What do you like in your breakfast sandwiches? Spray waffle iron with nonstick cooking spray and begin preheating. Combine the melted butter, baking mix, egg and milk in a large bowl. While waffle is baking, fry your eggs on a skillet, and when done to your liking, add 1/4 cup cheese on top of egg, cover with a lid, and turn off fire. Remove the waffles when they are golden brown or when your waffle iron signals they are ready. 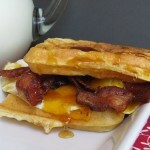 Begin sandwich assembly by placing two of the eggs, and the (now melted) eggs onto one of the waffles, add two pieces of bacon, and then add the second waffle to the top. Serve immediately with maple syrup as an optional side. Posted in Breakfast BreadsTagged breakfast, sandwich, wafflesBookmark the permalink. I tried this recipe and it was so yummy! It was easy to make and so simple. It was a big hit at my house and I will be making this again in the future! Thank you!